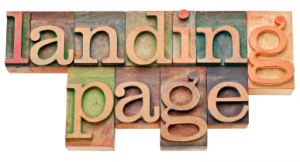 Many businesses are now aware of the fantastic benefits from creating a landing page. A recent survey by MarketingSherpa revealed that 68% of businesses now use landing pages to generate leads in order to convert them into future sales. While the advantages of landing pages may be clear to many businesses, many are not using them effectively. When using PPC and landing pages in conjunction with SEO your brand or product will gain the exposure that it deserves online. If this is the case, why is there so many people not using a landing page? Quite simply because many believe it’s easy enough to just link to their normal homepage and hope that a visitor will convert into a sale. In the strictest definition of the word a landing page is any page of your site that visitors arrive at after clicking on a link. That link could be a guest post that you wrote on a blog or from the description of a video you had on YouTube. Typically though the link will be from an online advertisement platform such as a Google AdWords or Facebook Advertising. 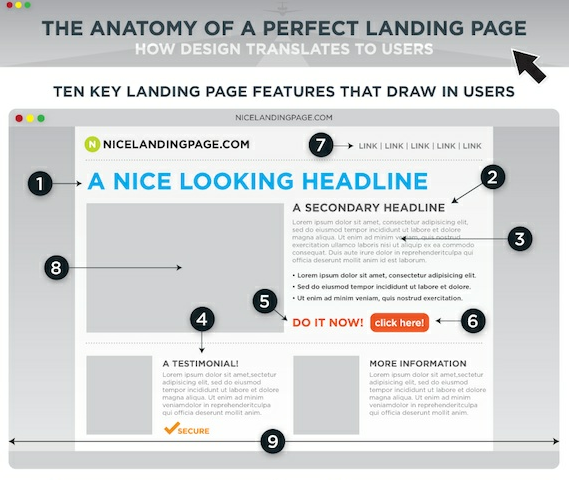 When we talk about landing pages in marketing terms we generally have something much more specific in mind. A landing page is designed to accomplish a specific goal. If the visitor to your landing page completes that goal then we consider this to be a “conversion”. If we divide the number of visitors who convert by the total number of visitors to the landing page we can establish a conversion ratio. The higher our conversion ratio the better. So what kind of goals might you want to achieve with your landing page? A common conversion goal is to get the visitor to provide contact information about themselves. Many landing pages will ask the visitor to give their name and email address. In return, they will be offered some form of inducement such as a free report or a trial of the businesses product. By obtaining the visitors’ email address the business can follow up with the prospect and develop a relationship with them while educating them about their product. This is typically called a “Lead”. Another conversion goal might be to get a sale. If a visitor chooses to purchase the product or service on the landing page then the visitor can be considered to be converted. Normally you would see this with landing pages where people are trying to sell you the next best product in weight loss or a guide on how to make a living – I’m sure we’ve all seen plenty of those. Establishing the goal of the landing page is critical because its design and layout will flow on from this. When we understand the goal of the landing page we know what to keep on the page and what to take off. A landing page will be stripped of extraneous content or links that can distract the visitor from completing the primary goal required. To understand why landing pages are effective it is useful to contrast them with what happens if you direct a new user to your homepage. On the homepage of most websites, there is a variety of different content and images that the visitor can look at. There are also links to other pages and posts that the new visitor can click through to. This is completely normal and to be expected of a standard website. However, this can be can overwhelming to a new visitor who will probably be looking for a more specific piece of information. If they cannot find that information quickly they will click away and visit another website. From the business owners perspective, it is difficult to funnel the visitor to a specific action such as providing contact details or making a sale because of the wide variety of choices that the new visitor has. In contrast, when a visitor arrives at a landing page there should be only two choices. The new visitor can complete the goal or they can click away from the page. The lack of distraction means that the user is far more likely to complete the set goal. Also, the landing page provides the visitor with direction and gives them a clear sense of what they should do next. When creating your landing page less is definitely more. You want to have a clear headline, subheading and easily to scan bullet points. These should explain why the visitor should complete the action that you want them to take. So for example, if you were offering a free report in exchange for their email address you could list the primary benefits of the report in bullet point format. Keeping it simple also applies to images. Multiple images can distract the viewer from completing the goal and so you want to minimise these. The call to action is a statement which clearly tells the visitor what they need to do. A call to action might be “Fill in your email address in the box below to receive access to our training video”. It is important to not assume that your visitor knows what action they need to take next, so this should be clearly laid out. It is critical that your landing page is consistent with where the users has been directed. For example, if someone clicked on a weight loss ad, then you don’t want your landing page to be about pet food. People have expressed an interest in losing weight and so the landing page should be on that topic. Consistency also means that if you are directing visitors from another page of your website that the colour and branding should be similar. This will help to reduce the likelihood that people will click away because they believe that they are in the wrong place. Finally, if you want to have a really high converting landing page then you need to test each element of the page. You do this by using what is known as an A / B test. With an A/B test you change one element on the landing page at a time. For example, you might change the wording in the headline on the first page and leave it the same in the second. You would then test to see which of these two landing pages had a higher conversion ratio. Testing allows you to know for certain which elements of your landing page are effective and which aren’t. Split testing is everything when it comes to landing pages, if you don’t test simple A / B elements then you could be losing a percentage of conversions which would have benefited your business more in the long run. A properly optimised landing page can have a huge impact on your business. According to figures released by HubSpot companies that have 30 or more landing pages generate 7 times as many leads as those that have 10 or less. Creating a landing page to be a part of your online marketing strategy is a must in this day and age where every industry is competitive.